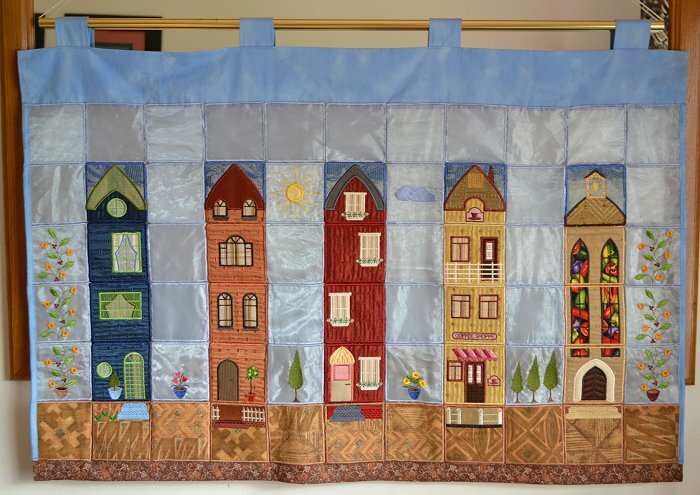 The Applique Window Blind blocks were used to create this window blind. You can use your own imagination and build the houses the way you want. You can make a window blind for your kitchen window as per our photo or you can make a curtain for that door that you want to hide. 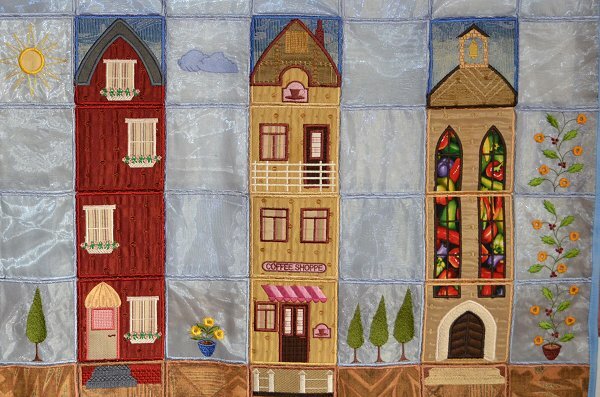 Just embroider more blocks and build your houses little bit bigger. 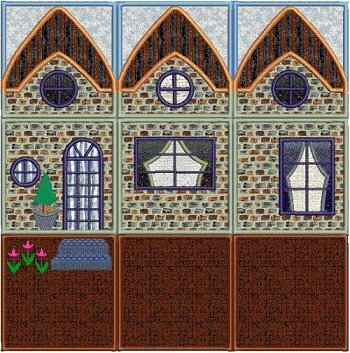 The applique window house blocks are designed to be embroidered as loose blocks. The blocks are then stitched or tied together. Eyelets can also be added to the corners of the blocks, and the blocks then tied together to create your own wall hanging or window/door blind. You can use trick film or a water soluable stabiliser Iike Vilene avlon plus. I have used trick film, which is like a plastic tearaway as stabilizer. I have hooped the trick film and embroidered the designs directly onto the trick film. I then removed the completed blocks from the hoop. The trick film adds some structure to the blocks. Please Note: Tear away will NOT work as the tear away gives way with every needle penetration. All the designs are digitized so that a backing or lining can be added last to cover all stitches. I went to our local fabric shop and bought some sample booklets of upholstery and curtain fabric and used that instead of quilt fabric. You get a lot of samples in the same color shades but with different textures - material for the walls, the lace curtains, etc. Please ensure you adhere to the attached color chart when stitching out the applique designs. Always remember to test stitch any design. Especially when you want to create something different. All the designs are digitized so that the applique design will be trimmed in the hoop. 1. Hoop Vilene Avlon Plus or Trick Film. 2. An outline will be stitched to indicate the position of the applique pattern. 3. Remove hoop from machine and attach fabric to be used for applique. (If you use Vilene Avlon Plus you can at this stage also add a layer of cut away stabiliser underneath your fabric to help keep the block nice and firm once stitched out - you can do this even if you use trick film). 4. An outline will now be stitched to indicate the trim line along which the fabric must be trimmed. 5. Remove hoop from machine and trim the fabric together with the cut away (if added) as close as possible to trim line. 6. Attach hoop to machine. 7. The trimmed fabric will now be tacked down. Each stage will be indicated on your machine as a different color. The rest of the design will stitch out according to your color chart. 8. When you get to stitch the backing or lining you must take your hoop out of the machine and place your backing/lining fabric to the under side of your hoop. 9. Put the hoop back in your machine. The trim guide line will now be stitched. 10. Remove hoop from machine, turn hoop upside down and cut backing/lining fabric as close possible to the trim line stitches. 11. Attach hoop to machine again and finish off your applique block. 12. Once completed (if you've used trick film you can just push the design out) remove the design from your hoop and cut most of the Vilene Avlon Plus away. 13. The blocks can now be combined by either stitching the blocks together with invisible thread, or you can put eyelets in the four corners of each block and combine the blocks with ribbon or string. 14. The middle block of the flower designs that I have used on the sides can be repeated so that you can make them as long as you want to.